Local/Common names – Jatamansi, Balchharh, Mansi, Machhi, Spikenard. Distribution – The herb is found in the alpine Himalayas from Himachal Pradesh to Sikkim in India and Bhutan, at altitudes between 3000-5000 m. In Himachal Pradesh, this plant is found in alpine rocky slopes in Manjiban, Jakha-Kanda, Tan-gankhai between 3000-4000 m. (Chauhan, N.S., 2421). Has also been collected from the Great Himalayan National Park area in Kullu district. Description – It is an aromatic, erect, perennial herb, 10-60 cm high with long, stout, woody rhizomatic rootstock covered with tail like brown fibres left over from the withered leaves towards the stem, while the root continues to penetrate deep in the soil. Leaves are radical in nature long, narrow and the flowers are creamy white, often rosy or pale pink in appearance arising in terminal corymbose cymes. Fruit is small, 4 mm long, covered with minute hairs. Market drug consists of a short portion of rhizome, as thick as little finger, dark-grey, covered by a tuft of fine, reddish brown fibres and gives an appearance of a tail. Fibres are malted together as a network. It has a heavy aromatic odour and tastes bitter. Main ingredients – The hairy roots contain essential oil having jatamansone, jatamansic acid, lupeol, jatamansinone, jatamansinol, jatamansin, angelicin, dihydrojatamansin, oroselol, oroselone, angelic acid, seselin, a and B pinene, A carene, b eudesmol, lemol, b-sitosterol, valeranone, valeranal, nardosta-chone and nardosinone etc. 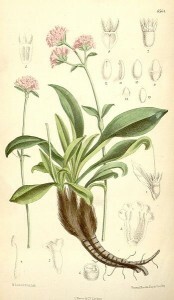 Rhizome also contains alkaloid-actinidin. The rhizome is considered as tonic, stimulant, anti-spasmodic, diuretic, deobstruent, emmena-gogue, stomachic and laxative. An infusion of the rhizome is reported to be useful in epilepsy, hysteria, leprosy, respiratory disorders, nervous excitement, palpitation of the heart and a tincture is given in intestinal colic and flatulence. The rhizome has the property of promoting the hair growth. The roots have remarkable properties to tone up the brain. Spikenard oil possesses antirhythmic activity with possible therapeutical usefulness in cases of auricular blutter. (Chopra, 1958:679; The Wealth of India, VII:3; Dey, 1980:63). Jatamansone is more potent than the oil and is also more active than quinidine in ventricular trachycardia, resulting from acute myocardial infarction and has also an anti-convulsant action. Prevalently used as a hair and heart tonic. (Chauhan, N.S., 1984). Preparations – Mansadi-kwath, Rakshoghna-ghrita, Sar-vousadhi-snan, Dasanga-lep, Laghu-visgarbha-taila, Pippalayasav and Becamin. Cultivation notes – The Nardostachys grandiflora plant is propagated by cuttings, divisions of under ground parts and sometimes by seeds. Rawat et al., (1985) have reported that in the absence of its cultivation know how, the plant is difficult to establish. The plant being of great importance as a drug and having been enlisted as endangered species needs special attention for cultivation taking support from micropropagation techniques.